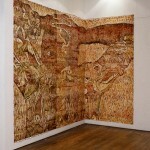 A Ballad to my Lord (1992) is a mural scaled multiple printed in three sections from carved plywood plates. The printing ink has an industrial plastic quality, and sits in visibly-raised reticulations on the surface of the paper. 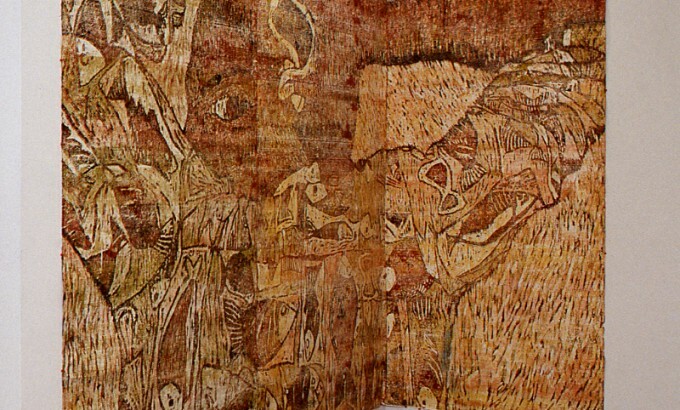 In a palette of rich earth tones, the print depicts a man of African descent looking gradually over his shoulder with his hands held up behind his head. The man is wearing an exuberant fish-patterned shirt which purposely draws attention away from the fact that he is being subjected to a search. The convert subject of harassment or persecution may be seen to make reference to both aspects of the history of Christianity and to the relationship between Toronto’s Black community and the MEtropolitan Toronto Police. Olabode Fakiyesi immigrate to Canada from Nigeria in 1975. 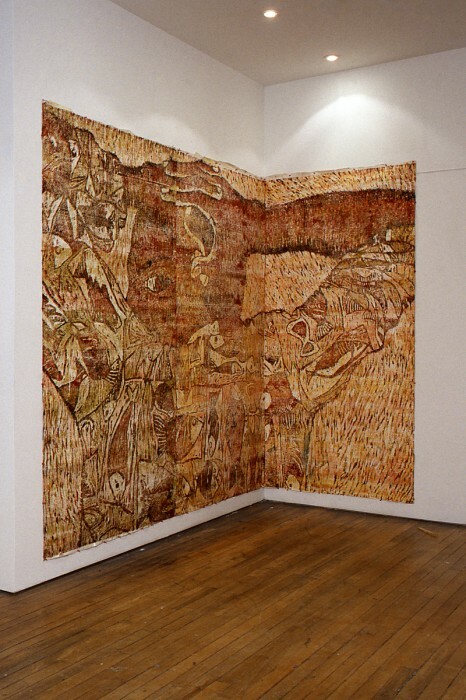 Since 1993, Fakiyesi has been involved with Artstarts, a North Toronto cultural centre and gallery, where he curated the group exhibition Inside Out. This spring, his work was included in a large survey of new work of emerging Black Toronto artists at 80 Spadina entitled Representing.